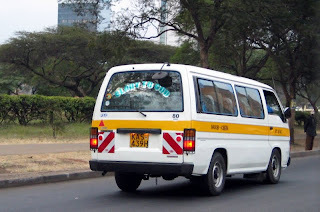 I took a matatu from the Ministry to Central Pub Lebanese restaurant yesterday after work. Twice on the way there I noticed a policeman get on and then off 5 minutes later without paying. "It's alright for some" I thought. Is this common practice by all drivers? Is it to avoid being hauled off the road for some minor offence? Anyway, upon reaching my destination the conductor says "three" to me. Ha! I'm no sucker, I know the price is only one pound ($0.50), so I offer him a one pound note. He waves me away - no "you go - it is free." Huh? Presumably there is something deeply suspicious about a khawaja getting into a matatu, to the extent you don't make him pay just in case... what exactly?